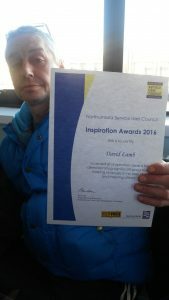 David, one of our current clients in Newcastle and Gateshead, was awarded an ‘Inspirational Award’ from the Northumbria Service User Council after being nominated by his probation officer this week. The event was held at HMS Calliope base on Gateshead Quayside. Here, Service Navigator Yasmin tells us more about David's story and why he deserves the award. David has spent years in and out of prison and in ‘out of area’ hostels. He was referred to Fulfilling Lives Newcastle Gateshead and was allocated when he was in custody. I visited him while he was still in prison, and we discussed the future and how things could be different this time when he was released. His motivation to make a real change was that he was now a grandfather and wanted to build relationships with his family. When David was released he had no fixed abode and was supported to yet another ‘out of area’ hostel, but this time, with the motivation to see his granddaughter, David was focussed on recovery. I referred him to an abstinence-based supported accommodation in County Durham after we had talked about this. Here, David came off substitute prescribing in 2 weeks after being prescribed it for decades. He then began to address his family issues. David was still excluded from the housing register despite the best efforts of the Fulfilling Lives team to exhibit how well David had done and to prevent the possibility of David slipping back in to old ways. So I decided to use personalisation – which is a budget our Service Navigators can use to help clients in tailored ways that aren’t currently available through the system(s) to offer them choice and control – to get David a private rent property. Having his own place meant that David could continue to engage with the recovery community and have a safe place to live – the first settled and safe place he has ever had. Since being in his flat he has not offended or used class A drugs – and he sees his granddaughter. The housing company have also agreed that he is no longer excluded from the housing register as he has shown he can manage his tenancy. David was nominated for this probation award for his achievement and progression and he was overwhelmed when he won. He hopes to win again next year! We’re thrilled to see such a progression in David, and will continue to help him lead a happy and fulfilling life.